Impact NW supports the health, well-being and independence of seniors & adults with disabilities by providing information and supportive services that help them remain in their homes, and activities to improve their quality of life. If you or someone you know is interested in Impact NW’s Activities and Services for Seniors & Adults with Disabilities, call us at (503) 721-6760. Your conversation will be completely confidential, and if Impact NW isn’t the best fit for you, we’ll help connect you to the services you need. 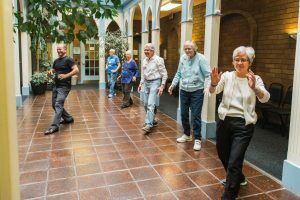 Seniors participate in a Line Dancing class at our SE Portland Multicultural Service Center. Our In-Home, Respite, and Adult Day Care Services Program provides home care, personal care, and grocery delivery services to help our clients continue living safely and independently in their own homes. In-home, respite, and adult day care services may be arranged to give temporary relief for the caregivers of those unable to care for themselves. Our Family Caregiver Support Program provides training, support groups, respite, and supplemental assistance to unpaid caregivers of seniors and grandparents who are guardians to minor-age children. This evidence-based, intensive, twelve-week program supports caregivers who are providing care to individuals suffering from Alzheimer’s Disease. The consultant provides one-on-one training and consultation to caregivers by identifying resistant behaviors of the person in care and assisting the caregiver in altering the care plan to change outcomes. Nursing students meet with clients one-on-one to assess their needs and develop care plans to assist them with their medication regimens. The nursing students also present educational seminars on medication management for low-income seniors at community centers and housing sites throughout the city. Impact NW’s Congregate Housing Services Program (CHSP) provides services to seniors and adults with disabilities living in one of several affordable housing complexes, including Dahlke Manor, Grace Peck Terrace, Rosenbaum Plaza, and Unthank Plaza. Our case managers assess each client’s needs and provide consultation, advocacy, and service coordination. If needed, in-home services are provided, such as housekeeping or helping clients with personal care. Dinner is prepared and served every evening and lunch on Saturdays in the dining room of each CHSP location. Seniors participate in a weekly Tai Chi class at our SE Portland Multicultural Service Center. 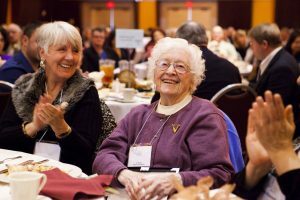 Our activities provide seniors with social opportunities that reduce feelings of isolation and depression, while also providing an opportunity for them to become aware of other services provided by Impact NW. 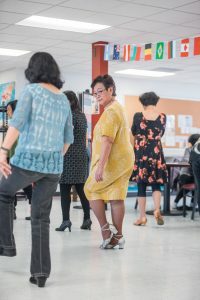 Every week, hundreds of seniors and adults with disabilities come to the SE Multicultural Center to take part in organized activities such as bingo, crafts, exercise and wellness classes, and for healthy meals provided by partner agencies. We host a variety of educational workshops, including a finance class, as well as cultural celebrations such as Mardi Gras and Cinco de Mayo. Health care professionals provide health screenings, immunizations, medication management, wellness education programs and foot care clinics. Evidence-based exercise classes such as Tai Chi are also offered. 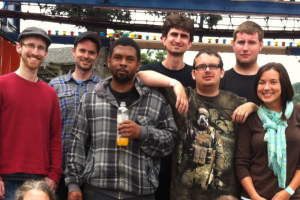 Club Impact participants have a blast at weekly events. Club Impact is a social club for young adults with disabilities and meets every Monday night from 6:00 – 8:00 p.m. at the SE Multicultural Service Center. Participants are welcome to drop by as often as they wish for all or part of a session. For more information about Club Impact contact Ralph Gilliam at (503) 453-6412.